EGIHosting Review 2019: Is EGIHosting a Good Hosting? If your business is in need of a highly dependable, secure, and fast hosting solution, EGI Hosting provides a number of suitable packages. With world-class global data centers, customers from the U.S. all the way to Asia can expect their servers to be highly available with low latency. EGI Hosting (or EGN, Energy Group Networks) was established in 2003 and has been focused on providing high-end, available, and redundant server space since its inception. They provide not only exceptionally fast computing resources and bandwidth, but also extremely reliable and robust solutions utilizing BGP networks for their managed colocating customers. They currently have facilities in the U.S. (San Jose and Miami) as well as Switzerland (Zurich). Recently, they’ve started to make inroads into the Asian market and now provide services in Chinese. Managed hosting: Have a dedicated technician set up and manage your server, looking after both its software and hardware. Streaming hosting: There are specialized plans for those who require dedicated video or audio streaming servers. Because this is a premium server/hosting solution, customers are guided all the way through the process, especially when setting up your server. With any plan (and as a given with a managed solution), you can request a technician to help you in any way. EGI Hosting doesn’t really cater to casual users; it assumes that you either have the expertise to manage your own servers, or you have your own IT support staff. Otherwise, a managed solution is best. Bare Metal Server Plans: These multi-homed and BGP redundant servers have four plans that cater for lower to high-end businesses. Pricier plans provide faster hardware with all plans including 1TB of storage. 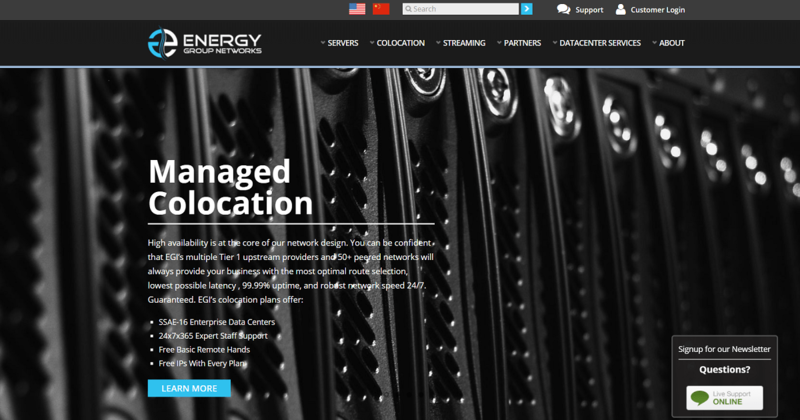 Managed Colocation Plans: This is for the ultimate level of protection for your information. Your server will be hosted on SSAE-16 TYPE II Certified, N+1 redundant servers. They guarantee 99.99% uptime with this plan. Fully Managed Servers: These are for those who want to take a hands-off approach and let a trained EGI technician take care of their server’s set-up and day-to-day maintenance. Three tiered plans provide faster hardware. There aren’t any free trials or plans. EGI Hosting does sell themselves as a premium server space provider. As such, they have highly trained technical staff in place at their server locations to quickly resolve issues. Their 99.99% uptime is proof of this. They also offer 24/7 live chat technical support, and in my experience, they respond quickly to queries (less than a minute). You can also email or call their support center. If you have enterprise-level needs for your site or require a server that’s beyond what’s on offer in the mainstream, then EGI is a great option. They provide a decent spectrum of plans and solutions for high-end clients and deliver a polished experience that makes you feel secure in the knowledge that your servers will always be available and backed up. Wondering how EGIHosting stacks up against other Web Hosting companies? Enter any other Web Hosting company and we will give you a side-by-side comparison.